Shakarkandi, also known as sweet potato, is a very popular super food which has numerous health benefits. Read the nutritional facts about shakarkandi here. These days we get sweet potato in abundance in the market and I use this healthy and nutritious superfood to make different types of fasting and non-fasting dishes which are savoury, sweet, steamed, grilled and roasted! 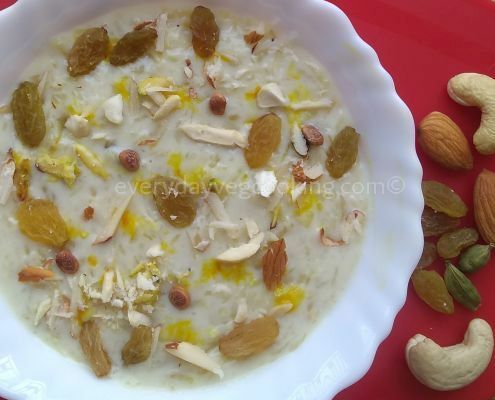 Today I am sharing the recipe of a popular north Indian delicacy, “Shakarkandi ki kheer” which is a perfect fasting dessert. To make this kheer, very few ingredients are required. Combine grated sweet potato with milk and cook until it thickens, then add little sugar and delicately flavour it with saffron, cardamom and finely chopped nuts. Heat desi ghee in a heavy bottom pan, add grated sweet potatoes and saute it for 2 minutes on a low flame. Now add milk to it and increase the flame. Occasionally, keep stirring the kheer and let it cook until you get desired creamy consistency. Now add sugar, saffron, chironji and cardamom powder. Continue stirring for 3 to 4 minutes. 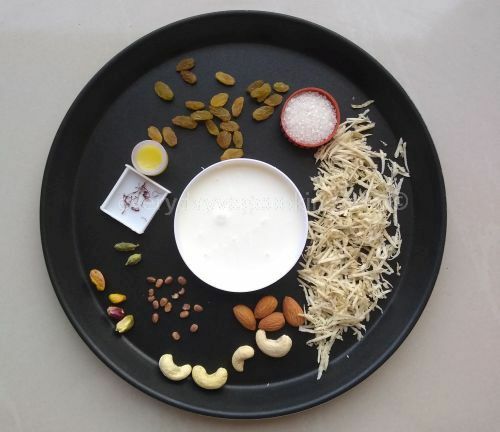 Transfer shakarkandi ki kheer to the serving bowl and garnish it with dry fruits. Healthy, nutritious and delicious Shakarkandi ki kheer is ready to serve. After grating sweet potatoes, immediately saute it in desi ghee, this will prevent it from turning black. Sweet potatoes are sweet in taste so adjust the quantity of sugar as per your preference.